NAC Sustain is a patented, extended release form of N-ACETYL-L-CYSTEINE (NAC), an antioxidant amino acid and a precursor to the critical antioxidant glutathione. Glutathione exerts a variety of protective effects, including detoxification and intracellular defense against oxidative stress. Substances known to reduce glutathione status are acetaminophen and alcohol. NAC has a biological half-life of 1.5 hours in the bloodstream. 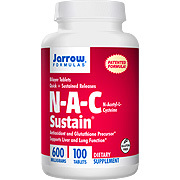 Jarrow FORMULAS® NAC SUSTAIN™ will release in the small intestine over a 4 hour period in order to maintain blood levels over a longer period of time. Take 1 to 4 tablets per day, preferably on an empty stomach with fruit juice, or as directed by your qualified health consultant. Other Ingredients: U.S. Pharmaceutical Grade N-A-C. Polyacrylate, calcium phosphate, cellulose, stearic acid, magnesium stearate and silicon dioxide. Contains NO common allergen. NAC Sustain - is shipped in a discrete, unmarked package. Orders are processed immediately and usually take about 3 to 5 working days to be received. We do ask that you try it for 2 to 3 weeks to feel the full effects. Any information received is used only for order processing and shipping purposes. Your information, such as e-mail address, will never be disclosed to a thrid party.